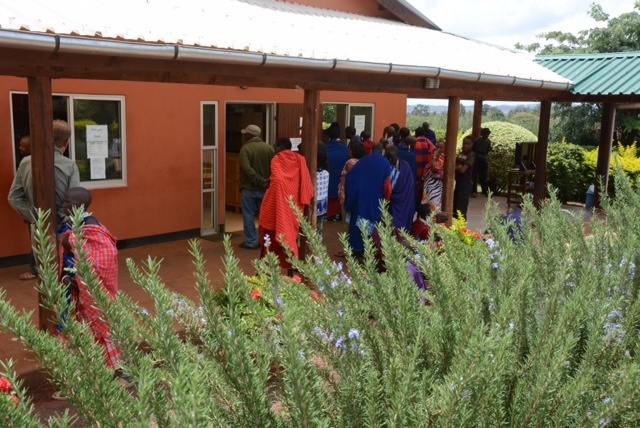 Today we were scheduled to go to the Rift Valley Children’s Village and small adjacent village of Oldeani. Fame runs a clinic there twice a month, but this was the first time we had done a neurology mobile clinic side by side. We packed up all of our medicines and supplies and drove separately from for the 45 minute drive through beautiful countryside to reach the Children’s Village. We were met by India Howell and quickly saw the large group of patients to be seen by us, not to mention the patients there for the regular clinic. There were 20+ patients for us to see and they were all very appropriate neurology patients which means they take longer than the regular patients the other side was seeing. The photo I’ve included is just our group of neurology patients and not the general medicine patients. Not just deworming and giving antibiotics, but taking seizure histories and the such is quite a bit more time consuming. After seeing several patients, though, we were quickly called out of our room for a young man who had collapsed out front. Luckily it was a patient we had seen yesterday at FAME and who we had asked to come back and see us today which he had done I guess in a sense. He was having continuous non-convulsive seizures and was unresponsive. We wanted to give him some IM Valium which took a bit longer to get organized then we wished, but eventually got taken care of. You can see in one of the photos Megan attending to the young boy with his mom and a nurse to give his IM injection. Several Mamas stood around him holding their skirts in a way so as to give him some privacy considering the crowd of patients we had. And as we couldn’t convince anyone to watch him for us to make sure he didn’t stop breathing, we simply put him in a chair in our room so we could keep an eye on him and continued seeing patients with him in the chair. His mom came in and out and he basically kept seizing for another 4+ hours even with another dose of Valium. We had no way of putting in an IV. Later in the afternoon it was readily apparent that the kid was not waking up so we made the decision to bring he and his mother back to FAME to get an IV in him. We carried him to the car and put him in the front seat with Megan and got everything loaded. We were unable to see probably nine additional patients which was unfortunate, but we’ll have them come to FAME and see them next Friday. As we drove out of the gate of the village to find Tobias’ mother and were waiting near their home suddenly he amazingly just woke up and looked at Megan. His mother hoped in and we decided to bring them back to FAME regardless. He chatted with Megan the whole way back to town and played with the toy giraffe she uses to examine children. On the way back and almost to the tarmac, the Land Cruiser started smoking a little and we had to stop to check things out. Turns out we had lost the AC belt, but since we don’t use the AC ever here and the car didn’t seem to be overheating I felt it was probable smoking when the belt disintegrated and wouldn’t cause any further harm so off we went. We dropped all the employees with us off at their homes on our way through town so it ended up being just Megan and me along with Tobias and his mother in the car. As we were just about to get to the gate at FAME he looked like he went to sleep, but off course was having another seizure. I had to carry him into the ward unannounced and put him in a bed. He was in tonic extension at the time and still remained otherwise non-convulsive. We got an IV in him quickly this time and gave him some more Valium and he snapped out of it pretty quickly. Our plan was to switch him from phenobarb to carbamazepine and so we quickly got his first dose in tonight before he seized again. What an experience and it certainly rivals Danielle’s seizing infant from last year. Very little can prepare you for such experiences and Megan did a stellar job given the very tough situation. These are the memories that will remain with us forever. We ended the evening with a nice get together at the Lilac Cafe for all the volunteers and some local ex-pats I’ve met before. 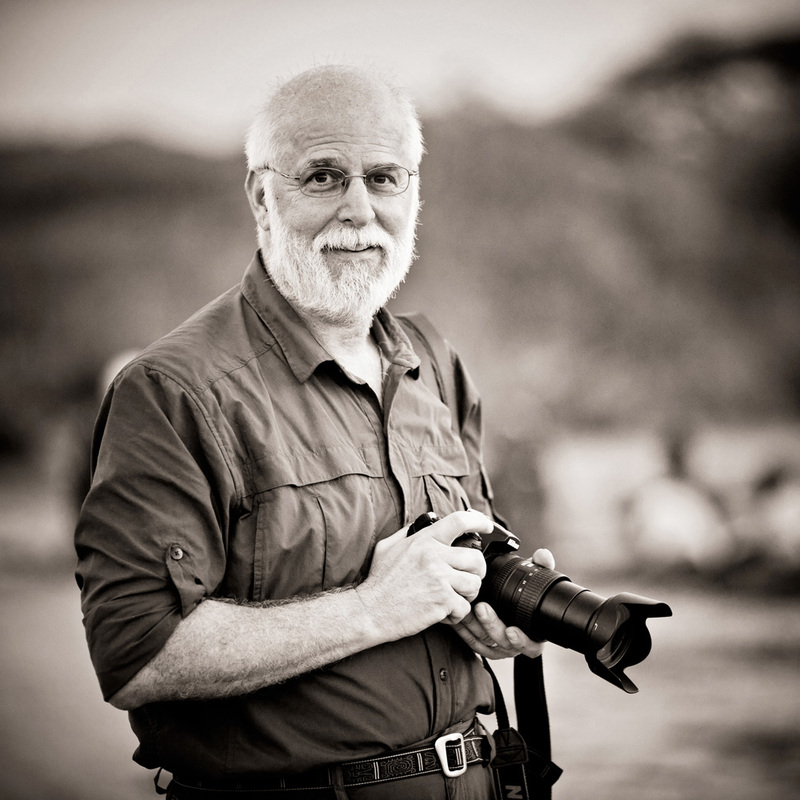 Tomorrow we’ll be on safari in Lake Manyara and then we start our mobile clinics on Monday. Another busy week here. More remarkable adventures to come. Well, we’ve finished our fourth day of neurology clinic at FAME and will be starting the mobile clinic portion of our visit tomorrow. It has been the best clinic so far in regard to the volume of true neurology patients here at FAME and William, our outreach coordinator has done a remarkable job recruiting patients for us. Tomorrow we head to Oldeani and the Rift Valley Children’s Village. The RVCV is an amazing home to around 80 or so children that have been adopted by India Howell as it is her concept that this should be the children’s home and that they should feel safe and not worry about being taken from their family. 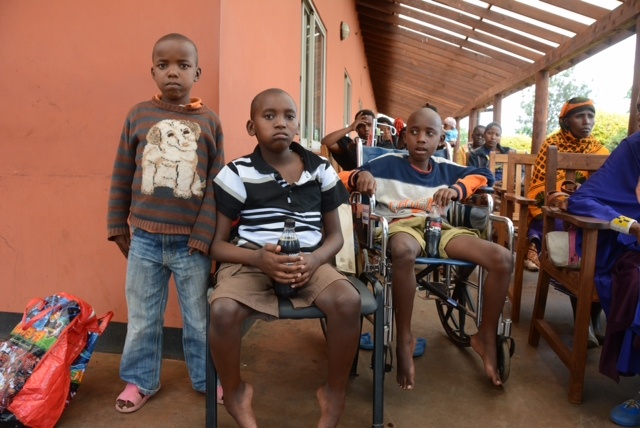 We started off today by seeing three boys being brought from Mto wa Mbu who have been unable to walk for some time. The first was a Masai orphan who has been unable to walk for several years and his weakness has not been progressive. We believe he suffered polio or a similar viral illness affecting the spinal cord. Then we saw two brothers with a progressive muscular disorder and most likely a muscular dystrophy, but which one? We immediately contacted our gurus at Penn to see what they thought and got responses very quickly. 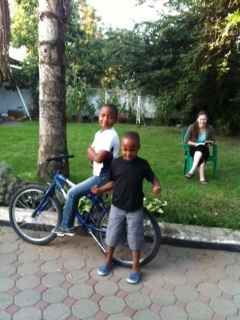 Here is a photo of the three boys, the two brothers being on the outside. We seemed to be pulled in all directions today and Megan and I had to split up again to get everything done. I saw a good epilepsy case at the end of the day as did Megan and we regrouped in the ward to finish up examining our stroke patient who had improved some. After clinic we took care of our emails to the specialists at home and then drove up to Gibb’s Farm for drinks on their veranda which has one of the most spectacular views of all time with lots of birds and other wildlife surrounding us. Dinner there was amazing as usual and at $25 (local’s price) it is one of the best buys around. Tomorrow is Oldeani as I mentioned and then Sunday we will be on safari at Lake Manyara. Well, I spent half and hour last night and again early this morning typing my daily log only to have it vanish from my iPad when I was inserting a photo…..ouch! Megan had a lecture to give this morning at 8am so we had to run up a bit early to set up and now I’m behind. Luckily, it was raining last night which means the patients come up a little later in the morning so I have a few free moments….I think. Thursdays are supposed to be slow here, but someone must have announced a special rate or something as we were pretty much swamped throughout the day. Megan and I started off seeing patients together, but had to split up after lunch to get everyone seen. We had a family with pretty classic migraines and medication overuse headaches. The usual complement of “GBM” or general body malaise with aches and pains. The last patient was a cute 9 year-old boy with a two year history of sleepiness that was mostly in the morning and was unable to stay awake in the office with us. A pretty good MSLT watching him with near zero sleep latency. No history of cataplexy, but pretty certain he has narcolepsy and was able to put him on some Ritalin and will see him in a week. Also sent an email off to Larry Brown at CHOP and had a reply from Larry and another sleep specialist there within an hour. Pretty good seeing a kid here and having feedback from the best pediatric hospital in the US that quickly. Had dinner last night with my friend Daniel Tewa. I visit with him and his family at least once while I’m here and it’s great for whoever’s with me to come along and visit a Tanzanian family in the area. Daniel is also Iraqw, one of the indigenous tribes in Karatu and has an Iraqw underground house on his farm that we got to see. Dinner is usually an experience as it is a traditional meal, but since Megan is a vegetarian and they weren’t sure what to do, his daughter (whose house we were eating at) had her uncle come help cook. Problem is that he was a chef at Gibb’s Farm for a time and prepared an incredible meal. Megan wasn’t subjected to some of the unusual foods that Danielle got to try last year (much appreciated) though we did each get to drink warm whole milk with dinner. Daniel and his family are very special and treat us like their family so it is a wonderful experience. Got to run and see patients right now. 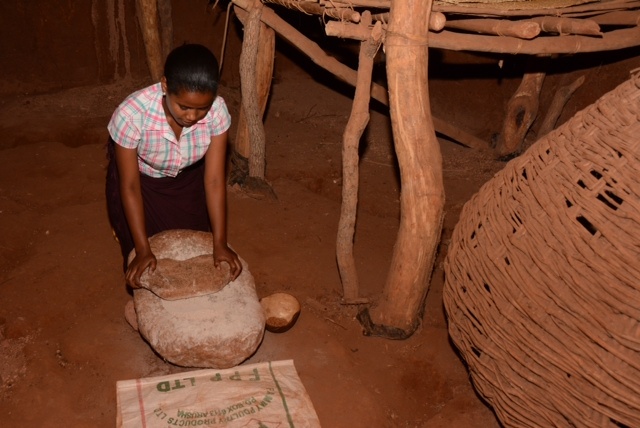 Here is a photo of Daniel’s daughter at the grinding stone in his original Iraqw house alongside a wonderful huge twined storage basket. Craig, Sheila, Brian and Bob will very much appreciate the basket. Also a photo of a busy clinic yesterday. Day two in the clinic and we still have interesting neurology patients coming. After a few initial patients for the day we decided to have Megan work with Dr. Gabriel and touch base with me regarding them while I began to work with Jacob as an interpreter so we could see more patients and not run as late as we did yesterday. One of the first patients we had was a little 5 month old baby born with a myelomeningocele and hydrocephalus (a Chiari II malformation) and who had been operated on in Arusha for the both the spinal cord problem as well as having a VP shunt placed, both at Arusha Lutheran Medical Center. The baby had done very well, but had no lower extremity movement. We really had little to offer then other than to take care of referring her to the rehab facility at Monduli where her family can get the instruction they need. The mom asked if we thought the baby would ever walk and it wasn’t easy to tell her that she probably wouldn’t, though I’m sure she had been told that before. Roza Andrea came back to clinic to see me. She is the young girl with Sydenham’s chorea bacterial endocarditis who I had seen a year ago with Danielle and who we’ve continued to treat. She had another exacerbation of her movements in November and saw Gabriel at the time. We treated her with another course of steroids at the time and she had some significant improvement in her movements. She is a real success story all in all, but I sure wish her movements would go away for good at some point. She is doing tremendously better, but I can tell that both she and her mother seem frustrated at times. Time will tell. We worked straight through until 2:30 in the afternoon and finally took a lunch break, but found that we had few patient later in the day so things were much slower. We were actually able to leave on time today and took a nice long walk along with Joyce right before sunset. A nice breeze started up and it was another gorgeous evening. We walked for over an hour and had a relaxing dinner on Joyce’s new veranda watching the final wisps of sunlight coming over Mount Ngorongoro and finally the local bats making their rounds searching for insects over our heads. It doesn’t get much better than that! 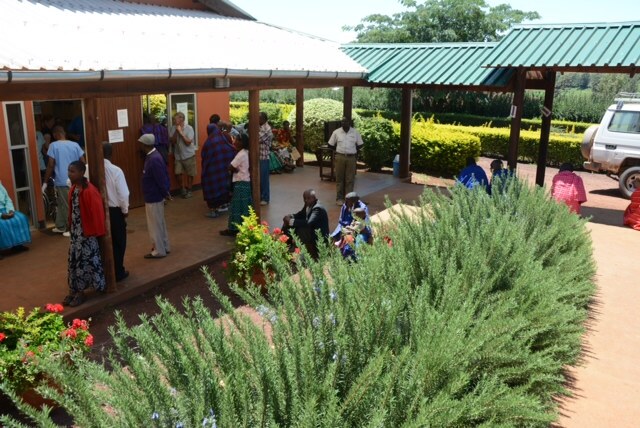 Here’s a photo of our busy clinic during the midday today. Roza is standing in the foreground in the read jacket. Walking to the first day of clinic in the bright warm sunshine of an East African morning has to be one of the most inviting experiences and it remains so for after all these visits. It’s been so long for me that I can only imagine what it’s like for the first time. As inviting as it must be on that first visit, though, there is still the apprehension of new faces, a new place and those expectations that we all place on ourselves. And so begins another journey. FAME began as single outpatient clinic offering it’s services and is now a complex care facility managing not only five times as many visitors as it did a mere four years ago, but providing inpatient, surgical and laboratory services that are available in few places so remote. Our schedule is to provide a neurology clinic at FAME during our first week here and then to provide neurology services in several villages that are somewhat distant from FAME where the journey may be a hardship for the patients or they may be simply unaware of the services available or the need for them. And of course we’ll take a day here and a day there to go on safari and see the amazing wildlife that shares the countryside. 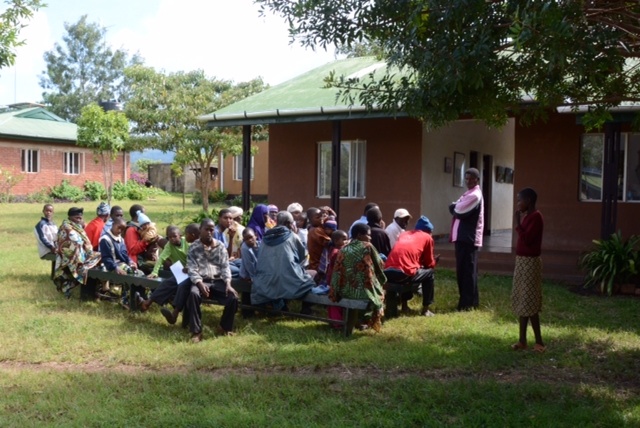 William, our outreach coordinator, does an incredible job getting the word out in the Karatu district as well as in the village areas of our impending arrival which was evidenced today by the number of patients that showed for our first day of clinic. We were unable to see them all and had to ask a number of them to come back tomorrow or in the days to follow. There is such a need for specialty care here that is so clear which makes the rewards so great. The doctors. clinical officers and nurses here are like sponges for information and with each visit it is so clear that they retain most, if not all, of what we have taught the time before. And so it begins, another adventure, another experience where it is difficult sometimes to identify who is the teacher and who is the student as it all melds together and makes it all worthwhile. 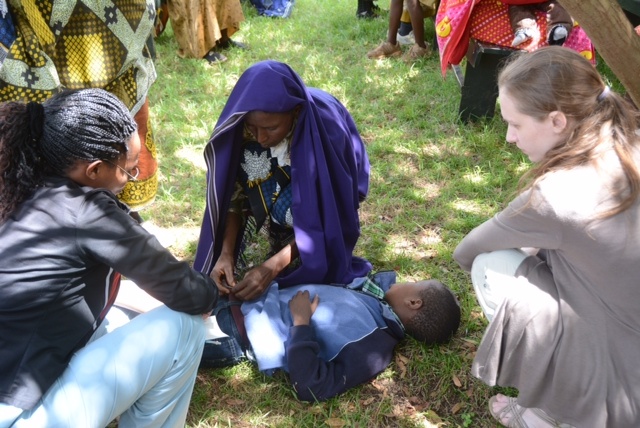 I’ll leave you with a photo of the student teaching, Megan evaluating a patient with Dr. Gabrielle, both incredibly capable clinicians and learning from each other….I can’t think of a more amazing place to be right now. 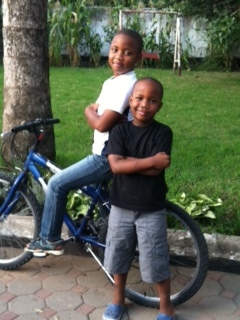 We spent the rest of the morning (when not on wild animal hunts) with the Temba boys (and by the way, Lennox is 8 years-old and not 11 as I mistakenly typed yesterday) before they had to leave for school and then ran errands with Leonard in Arusha. A trip to pay the tariffs on the Land Cruiser so when we get stopped at the police roadblocks for their “safety inspection” (otherwise known as a shakedown) they won’t be able to find any deficiencies. We were stopped about 1 km after we left Arusha and quite happy to have had the stickers appropriately attached so they just smiled and waved us on our way. It was uneventful trip across the Rift Valley here towards Lake Manyara and a gorgeous day. The view of the lake from on top of the rift was as amazing as ever and the lake was filled with flamingoes making it look like the water had turned pink. Since it’s the wet season everything is lush and green and coming into Karatu through Rhotia Valley reminds me every time what an truly beautiful place this is and how lucky I am to be here and to keep coming back. FAME has continues to grow, now with the ORs up and running and a third volunteer house that Joyce has built. Megan and I will get to work tomorrow bright and early and how much we’re looking forward to that. We’ll be here for four days and then off to Oldeani and the Rift Valley Children’s Village on Saturday for a mobile neurology clinic. We hope to take the day off on Sunday and then more mobile clinics next week to the villages along the upper rift. Welcome to the first installment of my spring 2014 trip to FAME and Tanzania. I’m typing this from my iPhone (with a bluetooth keyboard, thankfully!) as my iPad SIM card didn’t want to work on arrival and is now our first destination tomorrow morning to make that happen as my iPad is essential while traveling here not only for my email, etc., but also as my navigation system for getting to the villages. Megan and I had an incredibly uneventful trip here with a smattering of fortunate events. The first was to have been randomly given a TSA pre-check boarding pass which meant that I didn’t have to take all the electronics out of my carryon bag that I had so carefully wrapped – two MacBook Airs for FAME, my old iPad for FAME, my iPad and a brand new iPhone 5S for someone here. We had time in the club at Newark which totally blew Megan’s mind as she had never had the opportunity to relax in an airline club. The little perks of frequent travel. Our Amsterdam airport visit was short and the flight to Kilimanjaro went quickly – helped by a few movies and some sleep. We were through the immigration line quickly and our bags were nearly the first to arrive! 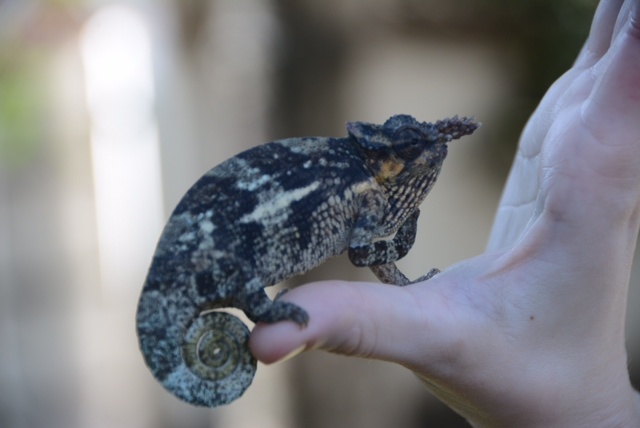 We found Leonard and Pendo and hit the road for the hour drive to their home. It was great to see both Lennox (now 11) and Lee (nearly 5) first thing this morning and they took to Megan immediately. I’ll have to admit, it’s so great to have Megan here as a bit of a buffer with the boys (Danielle will greatly appreciate that comment) as they can be a bit overwhelming at times, or perhaps most of the time. We spent a quiet day at home though Megan did accompany Pendo to the salon to get a bit of Tanzanian culture along the way. This afternoon, Megan and I took both boys out for a visit to a nice shop and then to town where I caved in and bought them ice cream at a nice little shop. Tomorrow we’ll be up early to do some last minute errands in Arusha and then it’s off to Karatu and FAME where we expect to be sometime in the afternoon. I can’t wait to get back there. It will be my eighth visit and I plan to keep doing this. Megan is a great traveler and having grown up in Indonesia makes her totally accustomed to a third world culture. She’s a natural at this. I didn’t do any photography today other than a few photos with my iPhone that I will attach. Lennox and Lee acting totally themselves in one and entertaining Megan in the other. It’s wonderful to be back in my second home and I’m looking forward to the next two weeks here.